Flagship program Created the downpayment assistance industry Nation’s largest and most trusted downpayment assistance program Over 250,000 individuals and families have become homeowners using The Nehemiah Program $1 billion provided in gift funds $60 million generated in charitable and community reinvestment activities nationwide Nehemiah started this program at a time when government funds for housing and affordable housing programs were disappearing throughout our nation and, along with them, the American dream of affordable homeownership. 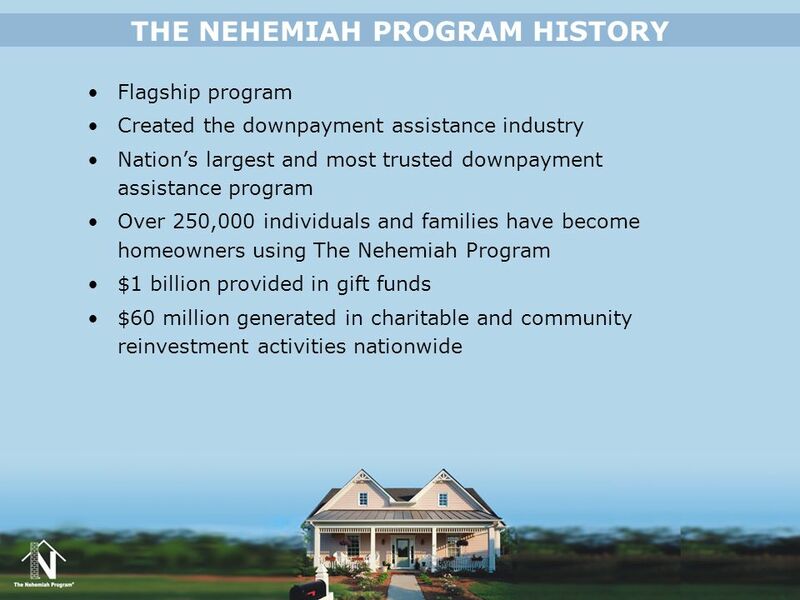 Now, The Nehemiah Program is the largest privately funded downpayment assistance program in the nation. Since it began in 1997, this program has helped over 230,000 families gain access to safe, affordable housing. Nehemiah is leading the way as the private sector solution to the shortage of affordable housing in the nation. To research additional information regarding Nehemiah Corporation, how The Nehemiah Program got started or the progress we’ve made, visit any of the following Web sites: Nehemiah Corporation: The Nehemiah Program Nehemiah Corporation News Archives: Nehemiah Corporation Press Release Archives: To save time, copy and paste the Web address into your internet browser. 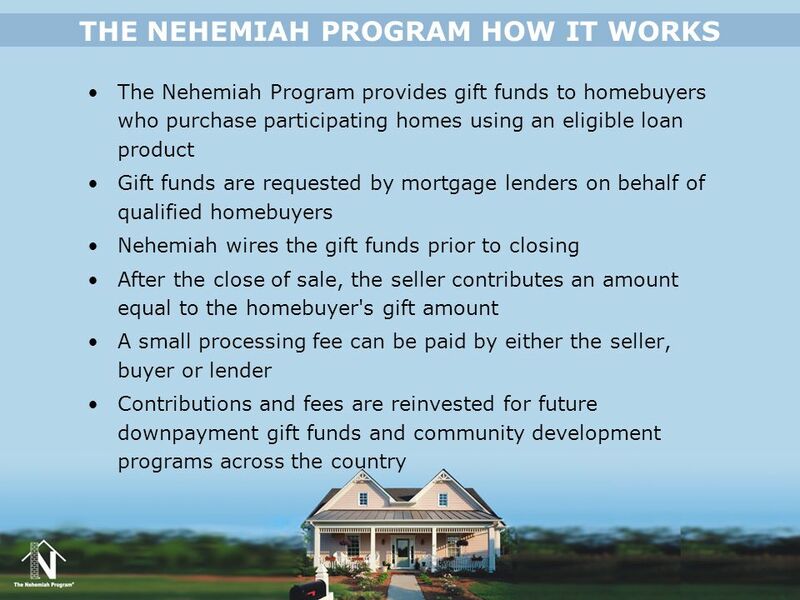 Exists for one simple purpose: Helping People Become Homeowners FREE gift funds up to 6% of the contract sales price Downpayment Closing costs If you have additional time, this is the perfect slide to talk about what makes Nehemiah stand out from the rest of the industry. Use the first bullet point to reiterate the fact that Nehemiah Corporation drives its business decisions based on the mission and vision of the organization, as previously discussed on the Nehemiah Corporation overview slide. You can stand proud with our company - and its products - knowing that “Rebuilding Communities From The Inside Out” isn’t just a slogan for Nehemiah. Feel good knowing contributions and fees are reinvested toward administration of continued gift fund efforts and community development programs across the country. Related Web Links Nehemiah News & Events: Sichelman, Lew, United Feature Syndicate, Got down-payment help? Be careful who gives it, Chicago Tribune Nehemiah Mission: Nehemiah Vision: To save time, copy and paste the Web address into your internet browser. 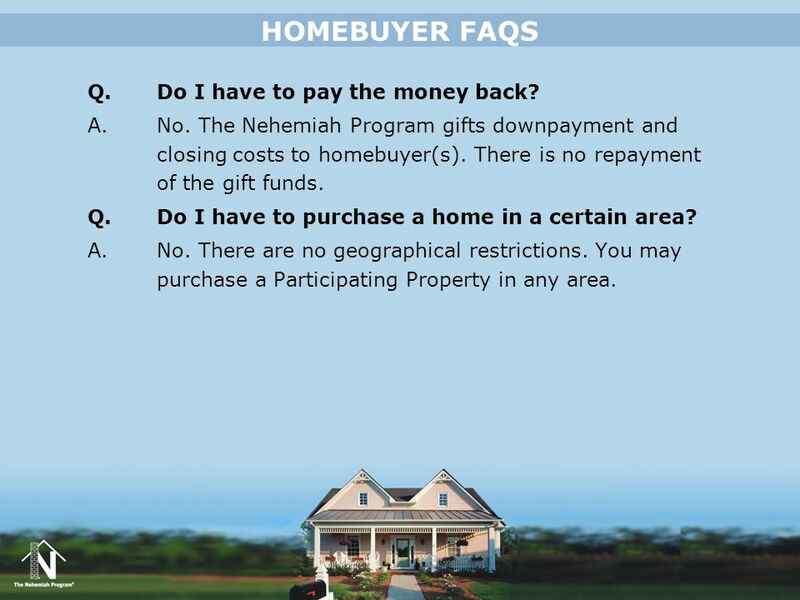 No repayment of the gift funds First time and repeat homebuyers New or resale homes No geographical restrictions HUD approved Usually homebuyers being introduced to The Nehemiah Program have a tendency to try and come up with something wrong with the program. Often times their first reaction is to think “It’s too good to be true!”. They often try to find a limitation or “catch”. There are none. This slide provides you with the opportunity to review program highlights and reaffirm for the audience that there is no “catch!” For additional information regarding The Nehemiah Program, use the following related Web links to include additional information. Nehemiah Forms and Guidelines: Compliance Documents: To save time, copy and paste the Web address into your internet browser. 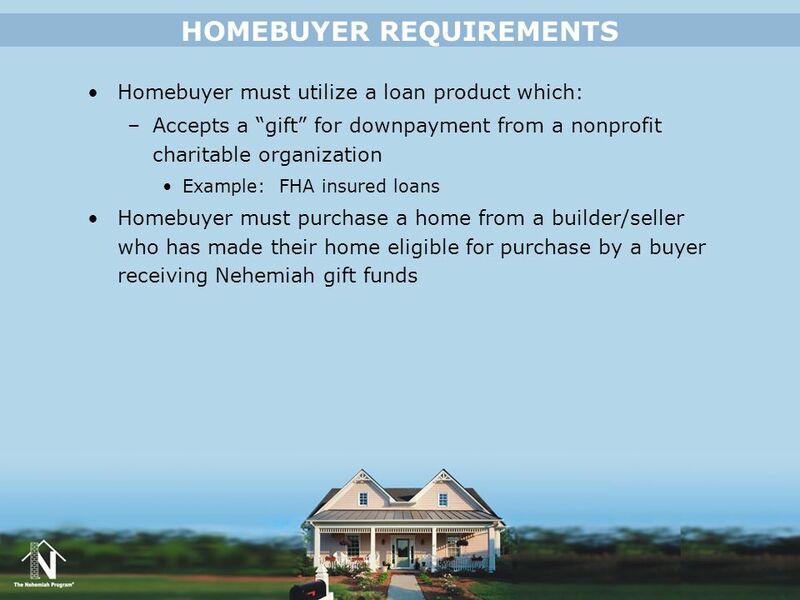 Homebuyer must utilize a loan product which: Accepts a “gift” for downpayment from a nonprofit charitable organization Example: FHA insured loans Homebuyer must purchase a home from a builder/seller who has made their home eligible for purchase by a buyer receiving Nehemiah gift funds Explaining downpayment assistance to homebuyers can most easily be accomplished by comparing it to receiving a “Gift” from mom and dad. In this case, Nehemiah “Gifts” your downpayment. 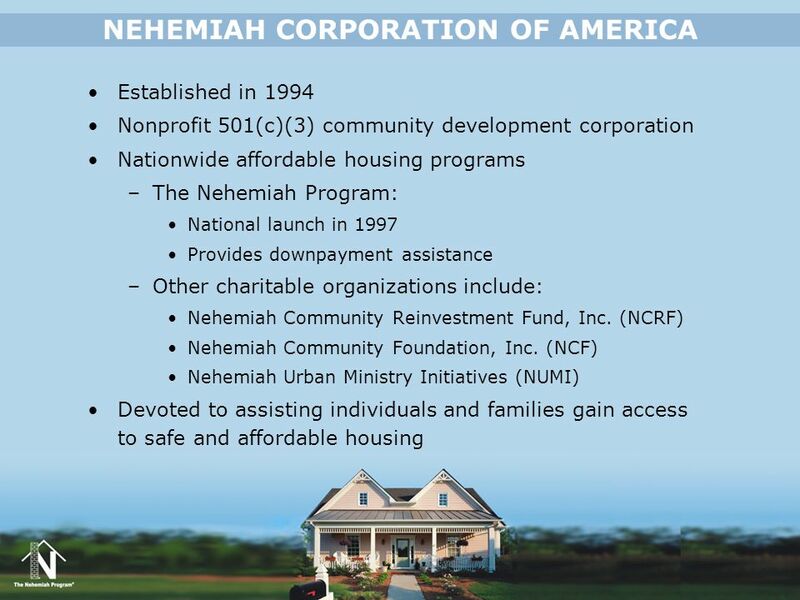 The Nehemiah Corporation is a 501(c)(3) nonprofit, which meets the guidelines of the HUD Handbook regarding allowable sources for gift money. The homebuyer will need to qualify for a loan product which accepts a gift for downpayment from a nonprofit organization, like an FHA loan. 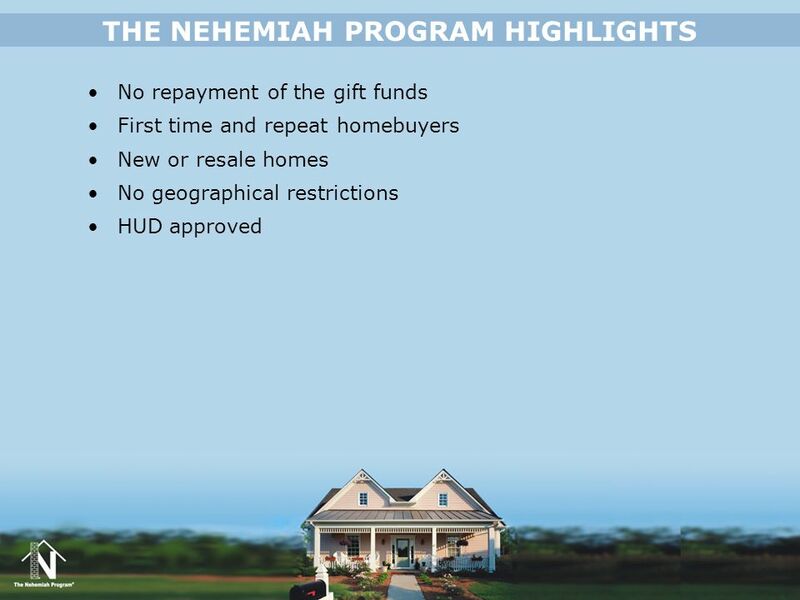 In addition, the property must be purchased from a builder or seller who has made his or her home eligible for purchase using The Nehemiah Program. Related Web Links FHA Mortgage Loan Limits in Your Area: Nehemiah Forms and Guidelines: Compliance Documents: To save time, copy and paste the Web address into your internet browser. New or resale home Condominium Duplex, triplex or fourplex Townhome Property type must qualify with the loan that the homebuyer is using There are two key components to identifying property types eligible for purchase with The Nehemiah Program. The first is that it must be owner-occupied. Put very simply, the homebuyer must intend to live in the home being purchased. 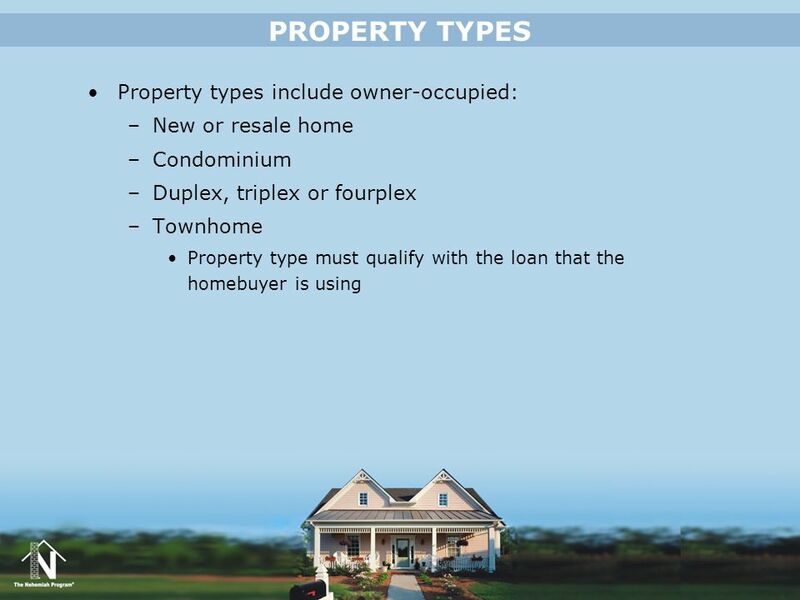 Second, the property type must qualify under applicable loan guidelines. Refer to the guidelines for the loan product that will be utilized. Related Web Links Nehemiah Forms and Guidelines: Compliance Documents: To save time, copy and paste the Web address into your internet browser. The Nehemiah Program provides gift funds to homebuyers who purchase participating homes using an eligible loan product Gift funds are requested by mortgage lenders on behalf of qualified homebuyers Nehemiah wires the gift funds prior to closing After the close of sale, the seller contributes an amount equal to the homebuyer's gift amount A small processing fee can be paid by either the seller, buyer or lender Contributions and fees are reinvested for future downpayment gift funds and community development programs across the country You can use this slide to describe how, in its most simple form, The Nehemiah Program works for all parties involved. In addition, you may chose to point out that, in most cases, the seller’s contribution is considered a cost of sale. We recommend that all parties involved check with a tax adviser. 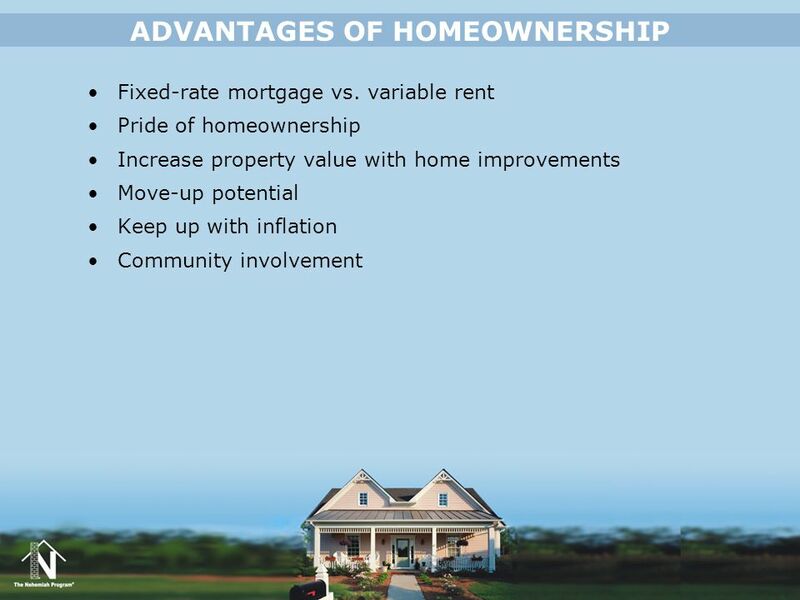 Fixed-rate mortgage vs. variable rent Pride of homeownership Increase property value with home improvements Move-up potential Keep up with inflation Community involvement Remind your audience that there are many benefits to homeownership. Most of us know that purchasing a home is a sound investment but some of us may not be fully aware of all the benefits. These additional notes can be used to discuss each point: Fixed-Rate Mortgage vs. Variable Rent - Rent payments will increase, while a fixed-rate mortgage payment will not! Pride of Homeownership - As a homeowner, you can improve your home to suit your style and needs. From paint to construction, the decision is yours! Owning a home may also give you a new sense of pride in your surroundings and what you have accomplished. Increase Property Value with Home Improvements - As a renter, you receive no financial benefits from improvements you make on the property, either to home or yard. As a homeowner, you can realize some or all of the costs and maybe even a profit from improvements when you sell your home. Move-Up Potential - With increased equity, tax savings and long term appreciation, it is much easier to afford your next home when you are ready to move up. Keep Up With Inflation - A home is an investment that historically has kept pace with and usually exceeds the rate of inflation. Community Involvement - Homeowners are more committed to their community. When you live in a neighborhood that is primarily owner-occupied, the tendency is for owners to maintain and/or improve their property, which automatically increases the value of your property. Not only is it a nicer place to live, the community as a whole increases in value. 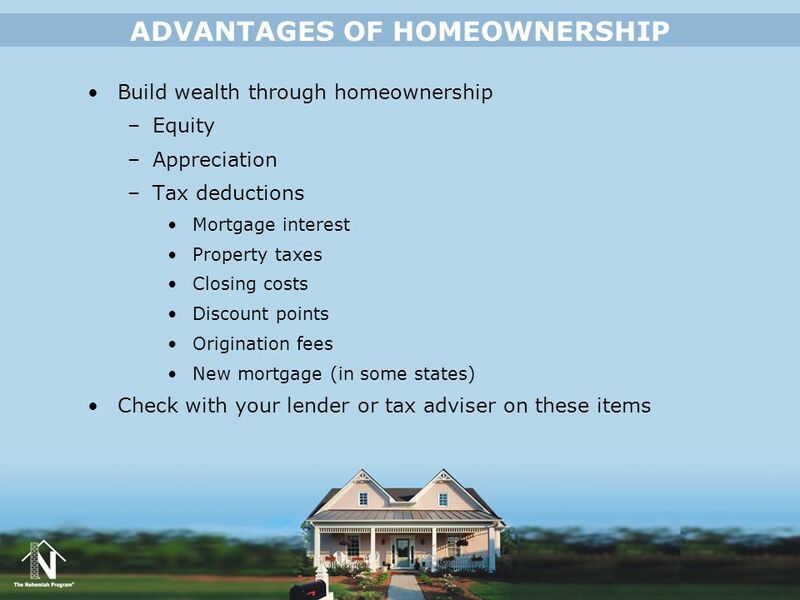 Build wealth through homeownership Equity Appreciation Tax deductions Mortgage interest Property taxes Closing costs Discount points Origination fees New mortgage (in some states) Check with your lender or tax adviser on these items One of the most prevalent advantages of homeownership is the ability to maximize your net tax dollars. Building wealth through homeownership is a very real benefit, which most new homeowners are either unaware of or need a little assistance in understanding. You can build wealth through homeownership by increasing the equity investment in your home. Equity is the total value of your home minus what you owe on the loan. With each mortgage payment you are building your equity. The longer you own the home, the larger your equity. There are also tax advantages. Homeownership allows tax deductions of the mortgage interest and property taxes annually, when you file your taxes. When financing a home you should seek to maximize every financial advantage you can. If your mortgage interest deductions will save you $ per month in taxes, you may want to reduce the withholding on your payroll. Contact your payroll department and request the change after you get professional advice from your tax adviser. Also, be sure to take advantage of all the deductible costs you will pay at the time of closing on your home. The basic ones that are fully deductible in the year you purchase your home are discount points, origination fees and, in some states, taxes on the new mortgage. Check with your lender or tax adviser on these items. Lastly, real estate will appreciate in value. How much it appreciates depends on the market conditions. 12 HOMEBUYER FAQS Q. Do I have to pay the money back? No. 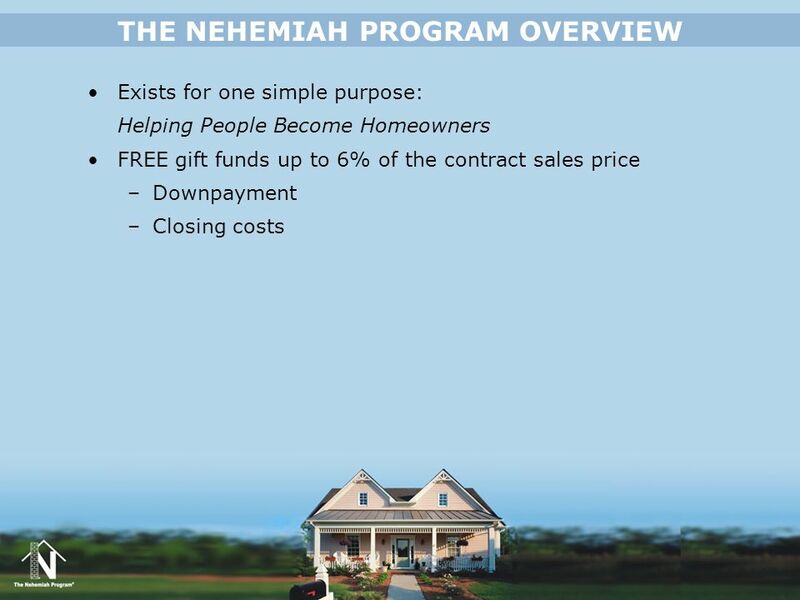 The Nehemiah Program gifts downpayment and closing costs to homebuyer(s). There is no repayment of the gift funds. Q. Do I have to purchase a home in a certain area? A. No. There are no geographical restrictions. You may purchase a Participating Property in any area. Undoubtedly by now, your audience has some questions regarding downpayment assistance. Take this opportunity to encourage audience participation. You can field some live questions or use the following as a guide to get you going. These homebuyer FAQ slides include our own “Top 10” list. 13 HOMEBUYER FAQS Q. Can I purchase a new home? Yes. Both new construction and resale homes are eligible. In fact, Nehemiah partners with many homebuilders across the nation. To view Participating Properties, find a new home community near you or contact a local real estate professional knowledgeable about The Nehemiah Program, visit Q. 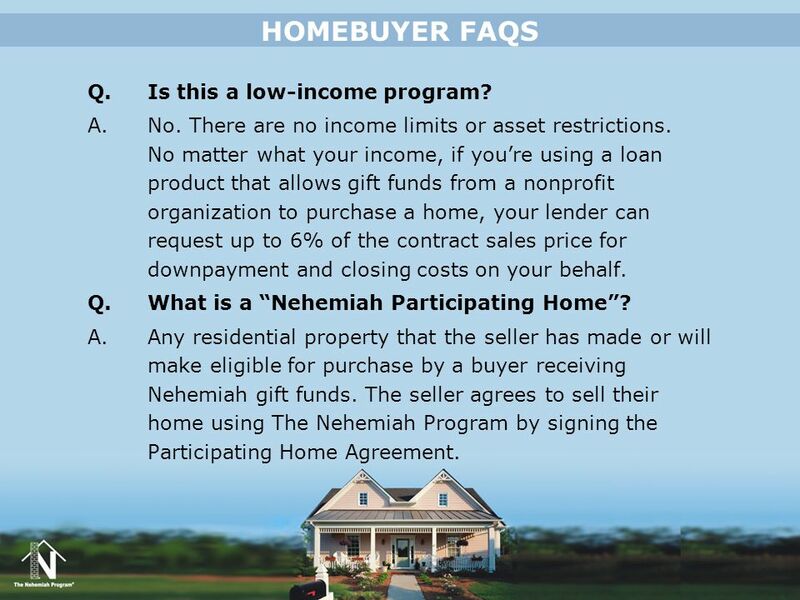 Do I have to be a first time homebuyer to use The Nehemiah Program? A. No. 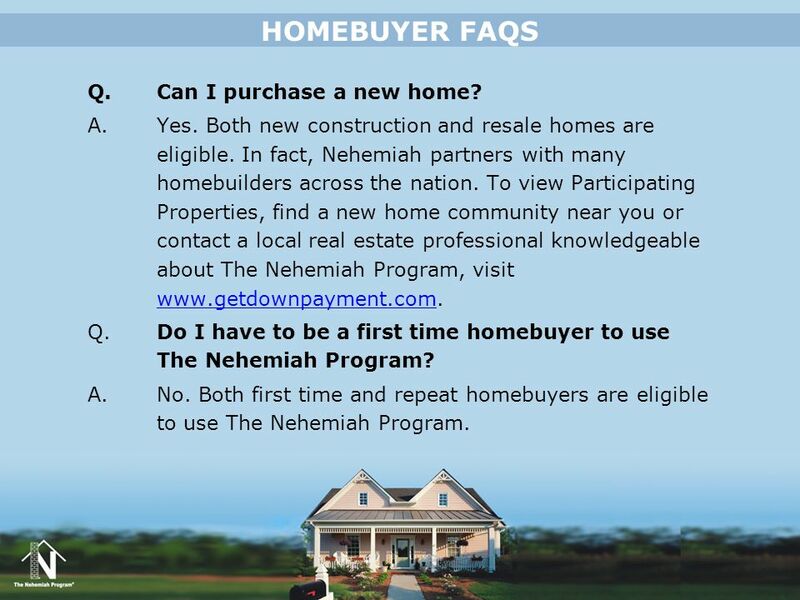 Both first time and repeat homebuyers are eligible to use The Nehemiah Program. 14 HOMEBUYER FAQS Q. Is this a low-income program? No. There are no income limits or asset restrictions. No matter what your income, if you’re using a loan product that allows gift funds from a nonprofit organization to purchase a home, your lender can request up to 6% of the contract sales price for downpayment and closing costs on your behalf. Q. What is a “Nehemiah Participating Home”? A. Any residential property that the seller has made or will make eligible for purchase by a buyer receiving Nehemiah gift funds. The seller agrees to sell their home using The Nehemiah Program by signing the Participating Home Agreement. 15 HOMEBUYER FAQS Q. Will using downpayment assistance delay when I can move into my house? A. No. Gift funds work in conjunction with an existing loan product (such as an FHA loan) so the process and underwriting are the same. There is no reason for this process to be extended. In fact, the paperless Online Processing System (OPS®) allows Nehemiah to process a gift funds request on the same day it is received. 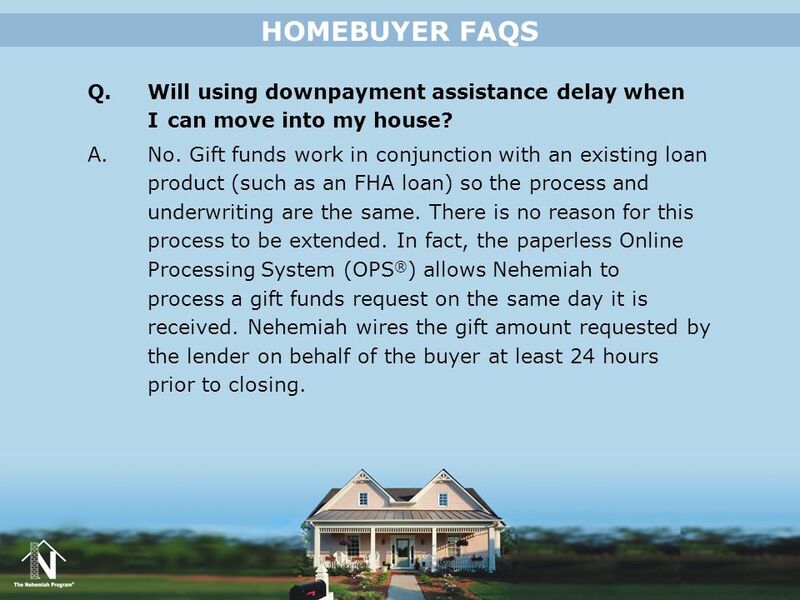 Nehemiah wires the gift amount requested by the lender on behalf of the buyer at least 24 hours prior to closing. 16 HOMEBUYER FAQS Q. Can I negotiate the sales price before telling the seller that I want to use downpayment assistance? A. Typically a homebuyer using downpayment assistance will purchase a home at market value without further negotiations or price reductions. This allows the seller to make a contributions back to Nehemiah after the close of sale and still maintain their desired net bottom line. 17 HOMEBUYER FAQS Q. Doesn't the seller basically pay the buyer's downpayment? A. No. Under mortgage guidelines, it is inappropriate for a seller to contribute money towards a downpayment in order for a homebuyer to purchase the seller's property. Nehemiah wires the money requested on behalf of a homebuyer from its pre-existing pool of funds and forwards it to the closing/title company. Only after the close of sale does Nehemiah collect the seller’s contribution and a small processing fee. Work with the industry professional(s) who are involved in this homebuyer educational event. They are already familiar with The Nehemiah Program and have a genuine desire to help you become a homeowner. 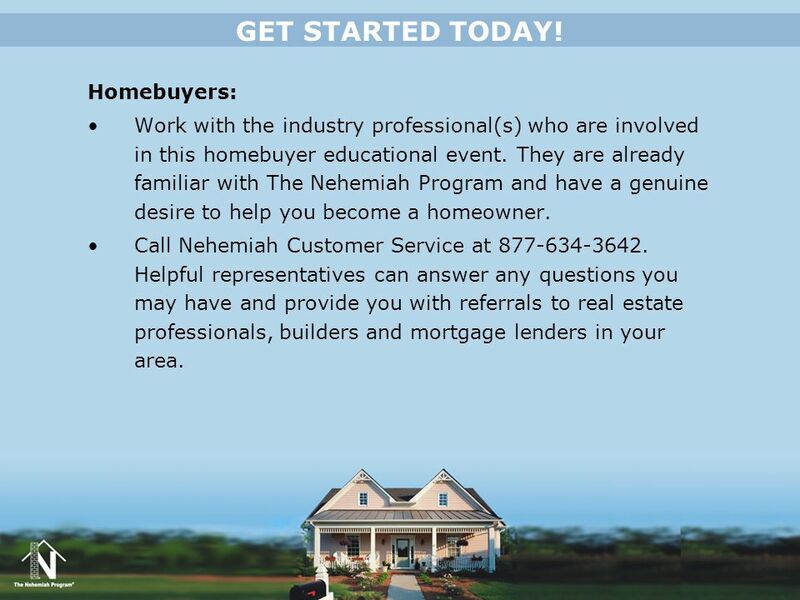 Call Nehemiah Customer Service at Helpful representatives can answer any questions you may have and provide you with referrals to real estate professionals, builders and mortgage lenders in your area. The Nehemiah Program Makes the American dream of Homeownership a Reality! 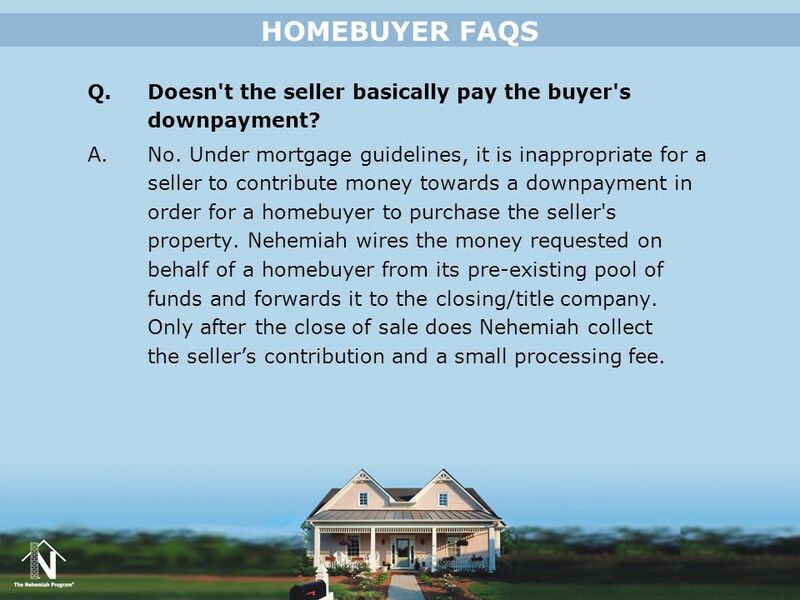 Nehemiah has partnered with homebuilders, mortgage and real estate professionals throughout the country to make the downpayment assistance homebuying process as simple as possible. 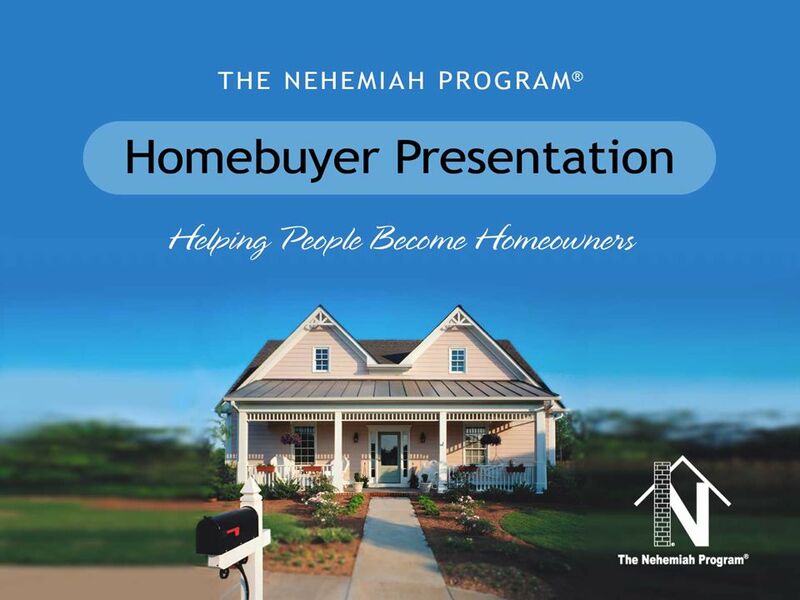 In just three easy steps, this quick reference guide shows homebuyers how to “Get Started TODAY!” using The Nehemiah Program. When printed, it becomes a handy reference tool for phone numbers & websites. Print this page as a quick reference guide for your audience to take home with them! 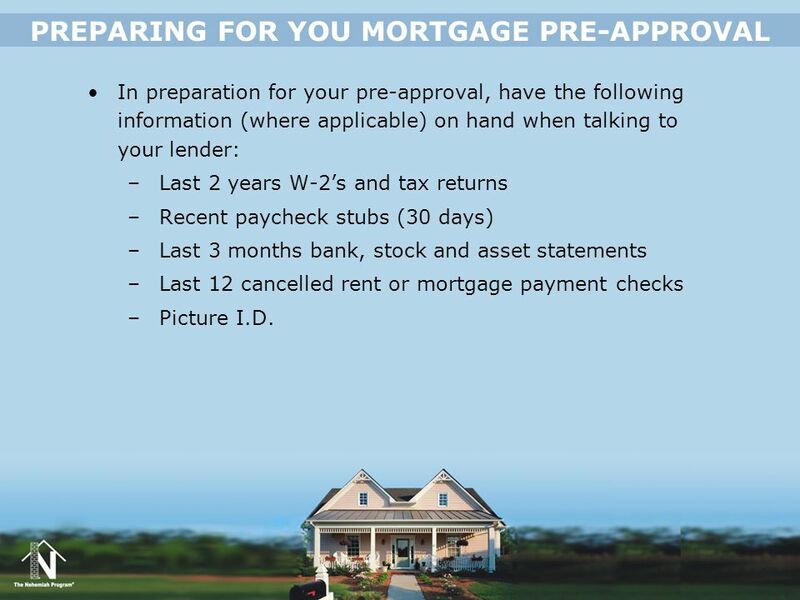 Get pre-approved for a home loan. This step lets you know how much house you can afford. Find Your Dream Home! Use a Designated Nehemiah Specialist or New Home Builder Partner to find your dream home. For more information, visit The Nehemiah Program Makes the American dream of Homeownership a Reality! 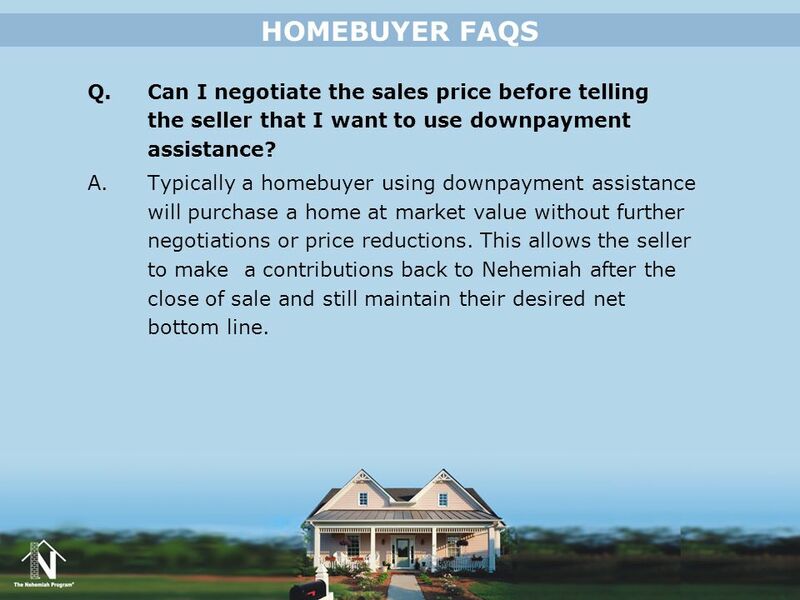 Nehemiah has partnered with homebuilders, mortgage and real estate professionals throughout the country to make the downpayment assistance homebuying process as simple as possible. 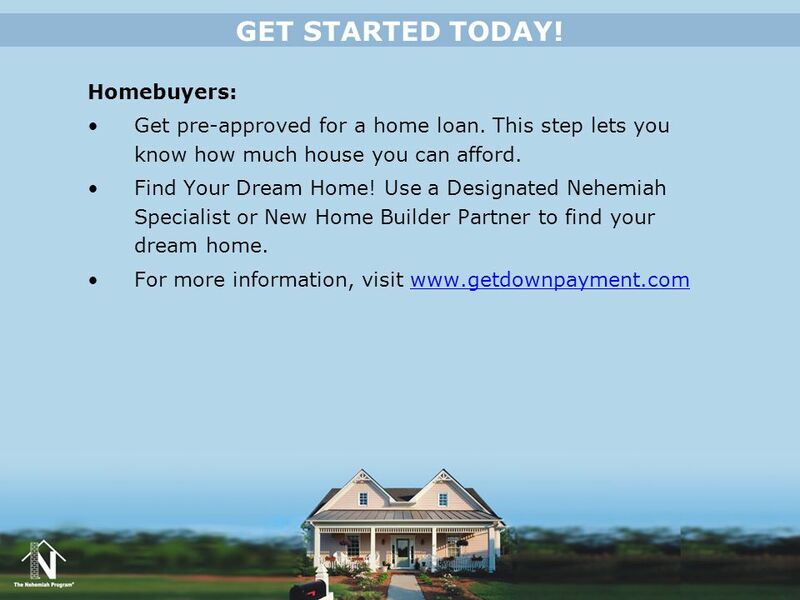 In just three easy steps, this quick reference guide shows homebuyers how to “Get Started TODAY!” using The Nehemiah Program. When printed, it becomes a handy reference tool for phone numbers & websites. Print this page as a quick reference guide for your audience to take home with them! 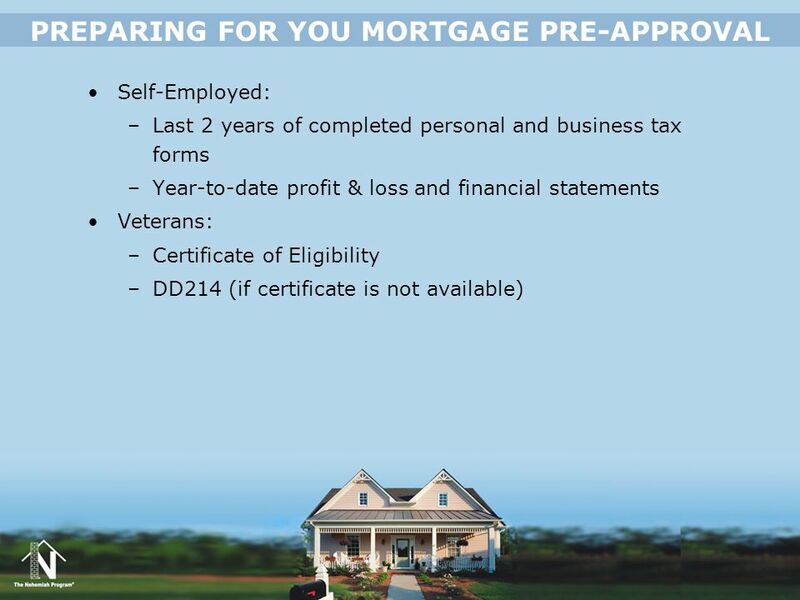 In preparation for your pre-approval, have the following information (where applicable) on hand when talking to your lender: Last 2 years W-2’s and tax returns Recent paycheck stubs (30 days) Last 3 months bank, stock and asset statements Last 12 cancelled rent or mortgage payment checks Picture I.D. So that the process goes smoothly for both real estate professionals and future homebuyers, it’s important to advise new homeowners of the proper paperwork to bring along when speaking to a lender for the first time. Following these recommendations will ensure a smoother and quicker pre-approval process. Free Nehemiah Online Homeownership Education Course English language: Spanish language: Home Inspections Impartial evaluations that provide homebuyers with information about the property’s overall condition Recommendations for the Homebuyers While not required, Nehemiah provides resources and recommendations to encourage responsible homeownership. Pre-Homeownership Education Course: Nehemiah strongly encourages, but does not require, all homebuyers to complete a homeownership education course. 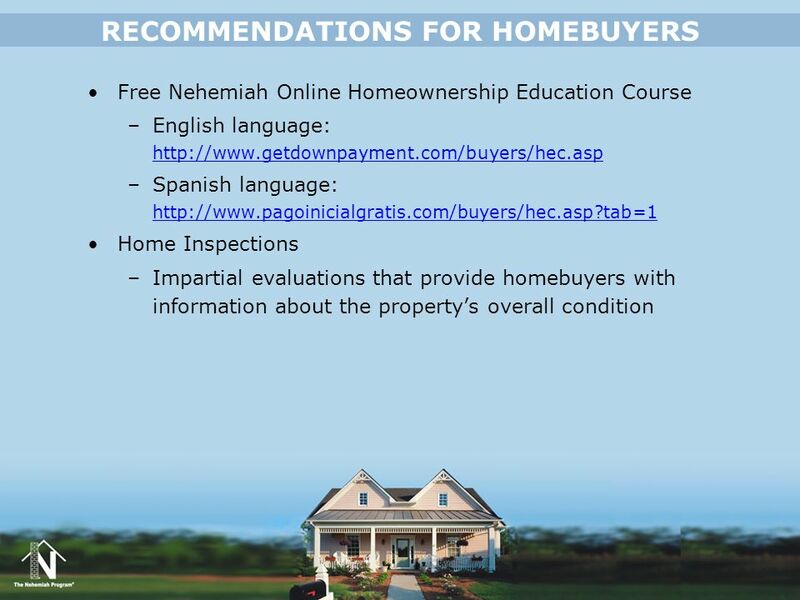 Nehemiah provides an online homeownership education course at no cost to homebuyers. Pre-Homeownership Course in English: Pre-Homeownership Course in Spanish: In addition, HUD-approved counseling agencies provide homeownership education courses to homebuyers. A list of HUD-approved counseling agencies may be found at Home Inspections: Home inspections produce an impartial evaluation that provides homebuyers with information about the property’s overall condition. An inspection may provide homebuyers with a list of items that need to be repaired or replaced. While not required, Nehemiah recommends that homebuyers obtain an independent inspection of the property. Please refer to HUD form CN (8-99), For Your Protection: Get a Home Inspection, for more details. 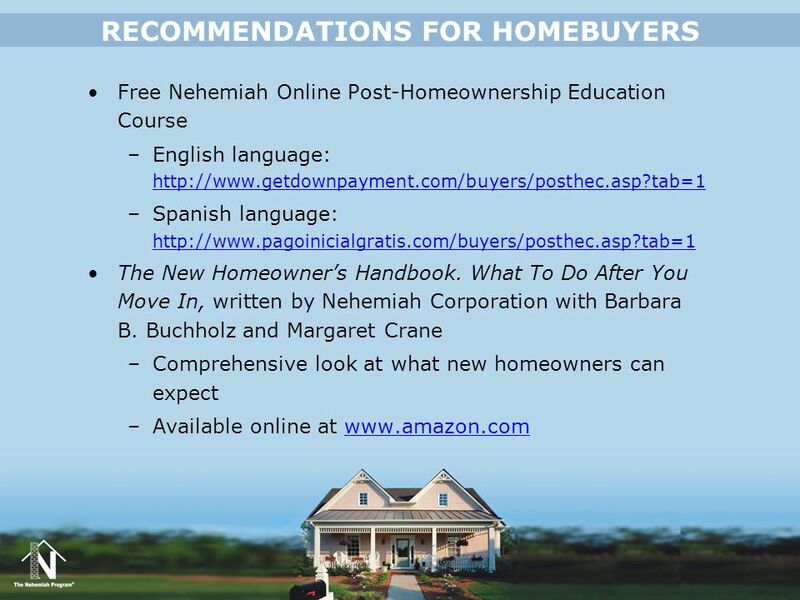 Free Nehemiah Online Post-Homeownership Education Course English language: Spanish language: The New Homeowner’s Handbook. What To Do After You Move In, written by Nehemiah Corporation with Barbara B. Buchholz and Margaret Crane Comprehensive look at what new homeowners can expect Available online at Recommendations for the Homebuyers The Post-Homeownership Education Course is designed to provide new homeowners with the information and confidence they need to make the most of their investment and achieve all of their financial goals. Post-Homeownership Course in English: Post-Homeownership Course in Spanish: The New Homeowner’s Handbook. What To Do After You Move In takes a comprehensive look at what new homeowners can expect after purchasing their home. In continuing its mission of increasing homeownership opportunities, Nehemiah has produced this book as part of their commitment to homeowners who are discovering the joys of owning a home and the challenges they may face. This book embodies Nehemiah’s philosophy of providing homeowners with useful information to help make informed decisions. 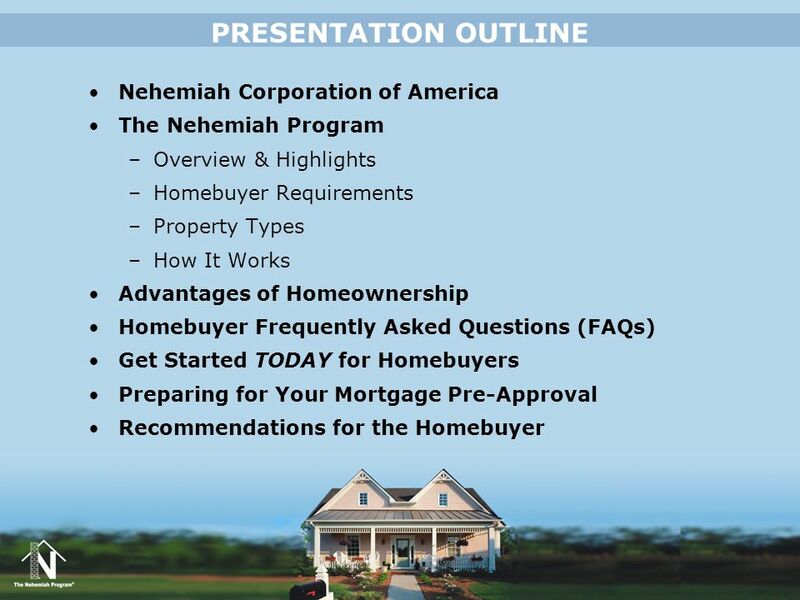 Download ppt "PRESENTATION OUTLINE Nehemiah Corporation of America"
Buying a Home in Todays Market Wells Fargo Home Mtg. Encino CA. 10/30/2012. H.E.L.P. for Homeowners ®...a program like no other. "Banks may have to swallow reductions in the principal of some troubled home loans to ward off greater. Steps to Homeownership and the Homebuyer Assistance Program Process Homebuyer Education ClassLoan OriginatorReal Estate Specialist HAP Processing Loan. American Dream Downpayment Initiative (ADDI). ADDI Basics  American Dream Downpayment Act (PL ) 12/16/03 - $86.9 million appropriated for FY2004. Renting vs. Owning The Difference Between Renting and Owning a Home. The Challenges Facing Today’s Mortgage Market Presented by Lori Stillwell. Homebuyer Workshop (Sample presentation) Add your name and contact information Mary Smith Appleblossom Realty Snowshoe, VT.
Homebuyer Education Seminar. Presented by: Cherise Walker Community Lending Specialist. HECM for Purchase Program Training for HECM counselors December 18, 2008. The Costs and Advantages of Home Ownership Fixed-Rate Mortgages Adjustable-Rate Mortgages Closing Costs Taxes, Insurance, and Maintenance -4-2. Navigating your entitlement to buy and/or sell a residence under Permanent Change of Station orders. Delaware State Housing Authority Governor’s Conference on Housing DSHA Homeownership Programs October 11, 2012. Nevada Housing Division First-Time Homebuyer Down-payment Assistance Loan. Objective 2.03 Analyze financial and legal aspects of home ownership.